Well, this is huge, so I'd like to draw your attention to what's happening right now. This is a very alarming case, and it concerns every ad blocker user. To understand better what's happened, you should first learn a bit more about ad blocking. Every ad blocker work is based on using so-called filters lists, which are maintained (mostly) by volunteers. That said, whichever ad blocker you use, credits for actual ad blocking belong to the filter lists maintainers. The most popular filters list is called EasyList and this is what this story is about. Got it, so what happened? Yesterday a strange commit landed in the EasyList repo. The "functionalclam.com" domain was removed with a comment "Removed due to DMCA takedown request". A small research was conducted by the community in the comments section of that commit. It appears that the story began 23 days ago with a comment by a freshly registered Github account to the commit that added "functionalclam.com" to EasyList. @dmcahelper threatened with "the file or repository disruption," but his threats were not taken seriously that time. 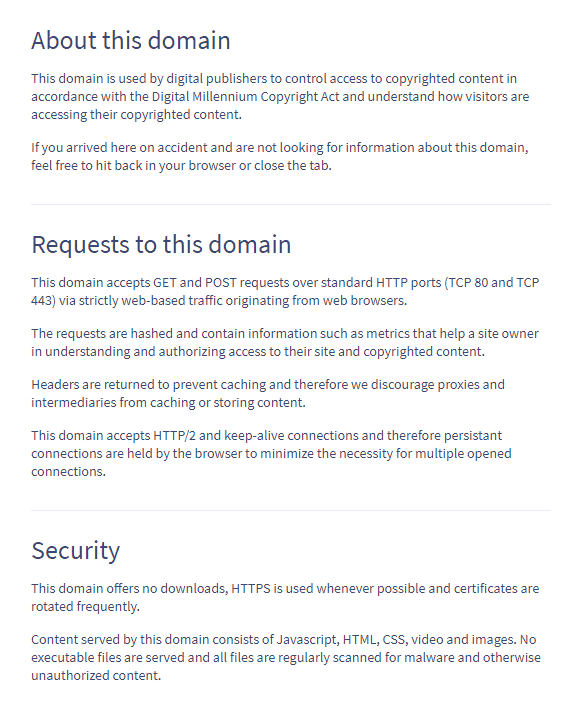 The domain in question hosts an image describing its work as "used by digital publishers to control access to copyrighted content in accordance with the DMCA and understand how visitors are accessing their copyrighted content". However, further research showed that this domain hosts the code of an anti-adblocking startup Admiral, so we can assume that it is the company we should blame for this. Where did they get this glorious idea? The wording of the original comment from 23 days ago reminds me awfully of this post claiming that DMCA can be applied to ad blockers. This might set a very important precedent of an advertising company exploiting DMCA to force people to see their ads, and can lead to ridiculous consequences if left unnoticed. EasyList is a community project and may not be able to protect themselves from such an attack. I am calling on other ad blockers developers, you people and everybody else concerned about people's rights (EFF, please) to stand up to this threat and protect ad blocking. UPD (11 Aug, 8:09GMT): EFF representative offered their help to EasyList maintainers. How does an ad blocker work? What does the quality of blocking depend on? How do some ads get past it? What differentiates ad blockers from one another? Such questions are not just a matter of curiosity. Knowing the answers can help one select and use a blocker more efficiently. Weather forecast app AccuWeather was caught sending data about users’ whereabouts even when denied access to the location to a company named RevealMobile. Pressing button "don’t allow" in respond to its location request stops the app from receiving GPS coordinates, but still, lets it see and send the device’s MAC address and router’s identifier.